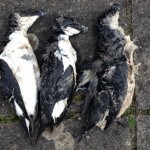 In late March 2014, Jersey hit the mark of a thousand dead seabirds found on its shores; the Island total since reaching 1,022 with numbers in the Channel Islands overall to just under 1,300 birds. In a regular winter we might expect between 10 and 40 dead seabirds on our shores over a few months, recorded by a few local birdwatchers that check the beaches regularly. But this year was different, and even when we did start to realise that things weren’t quite as usual, we never suspected we’d end up with over one thousand dead birds in Jersey alone. This kind of event with so many dead seabirds is known as a wreck. 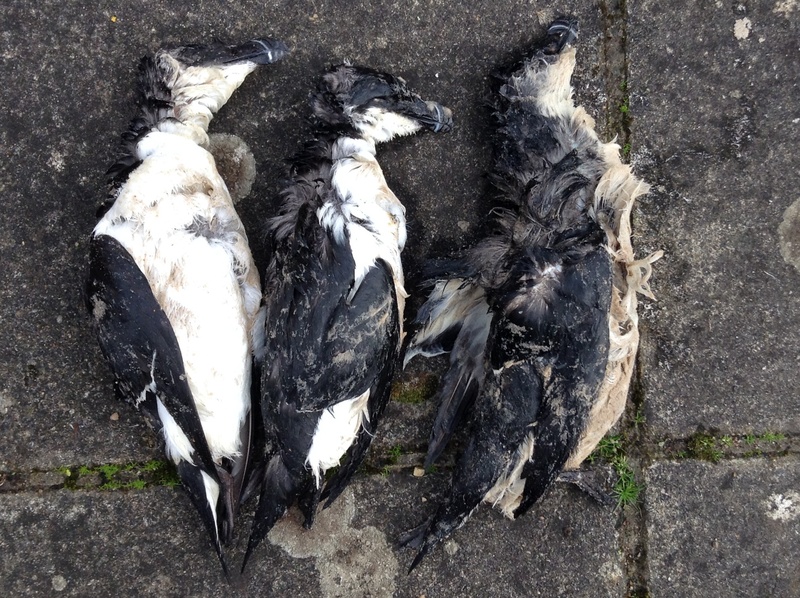 It was late January when numbers began building up and we started finding dead birds by the dozens in single stretches of our coast. Other birds were found still alive and taken to the JSPCA. At the same time, members of the public started to report dead birds, asking why this was happening and wanting to help and become involved. A record system was set up with Dr Glyn Young from Durrell taking in the records via email, the Jerseybirds website or the Jersey Wildlife Facebook group. A protocol for photographing the carcasses and disposing of them was advised to the general public, so that the identification of the species could be confirmed and so that the same bird wasn’t reported again by another person. As awareness of the wreck spread, more people started to look for birds to report. Predicting a surge of reports over the weekends, we set up a series of co-ordinated surveys on four consecutive Sundays. These searches involved a team of 25-30 volunteers checking sections of the Jersey coastline, collecting all the birds found and taking them to an arranged collection point, where carcasses were laid out, identified and examined. 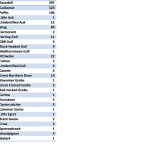 Much information was gained from these counts, as well as allowing many people see some bird species for the first time: such as razorbills, great northern divers, grebes, kittiwakes, and, of course, puffins, which were instantly recognizable with their tuxedo suits, short yellow feet and colourful beaks. 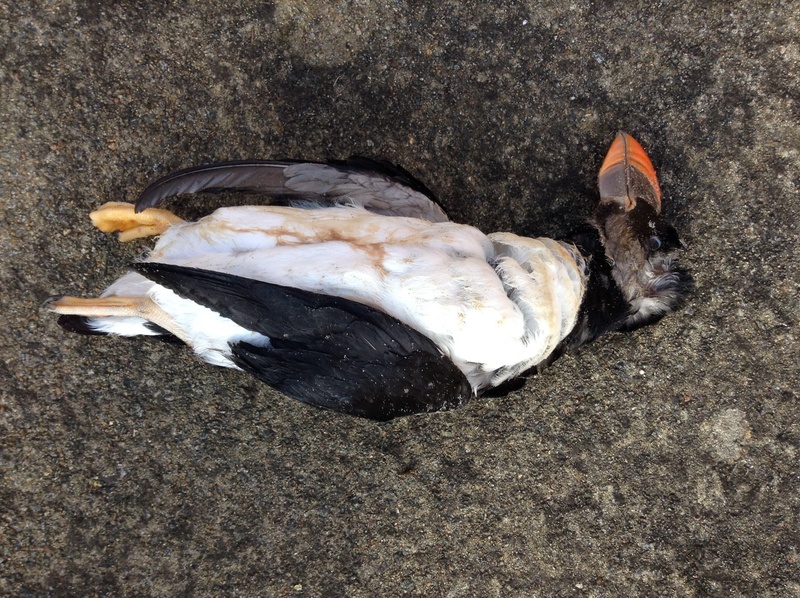 Indeed it was a very sad occasion that many people commented on, that the first puffin they or their children had seen was a dead one on the beach. 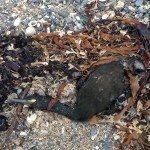 With the numbers from surveys and individual reports piling up, a worrying picture started to develop, encompassing rare finds (common scoter, red-necked grebe, little auk) and ringed birds whose origin could be traced to colonies in Skomer Island, the Hebrides, Orkney, France and, for many shags, the Channel Islands. Some birds that were examined post mortem were found to have drowned, starved, or both; while samples, frozen carcasses and photographic evidence were sent to various UK-based scientists to contribute towards their long-term research. Many questions have arisen from this environmental disaster, here are some answers gathered from the scientific community. What species have been affected? Auks (guillemots, razorbills and puffins) made up the largest portion of the casualties, with significant numbers of shags, great northern divers, kittiwakes and gulls following behind. 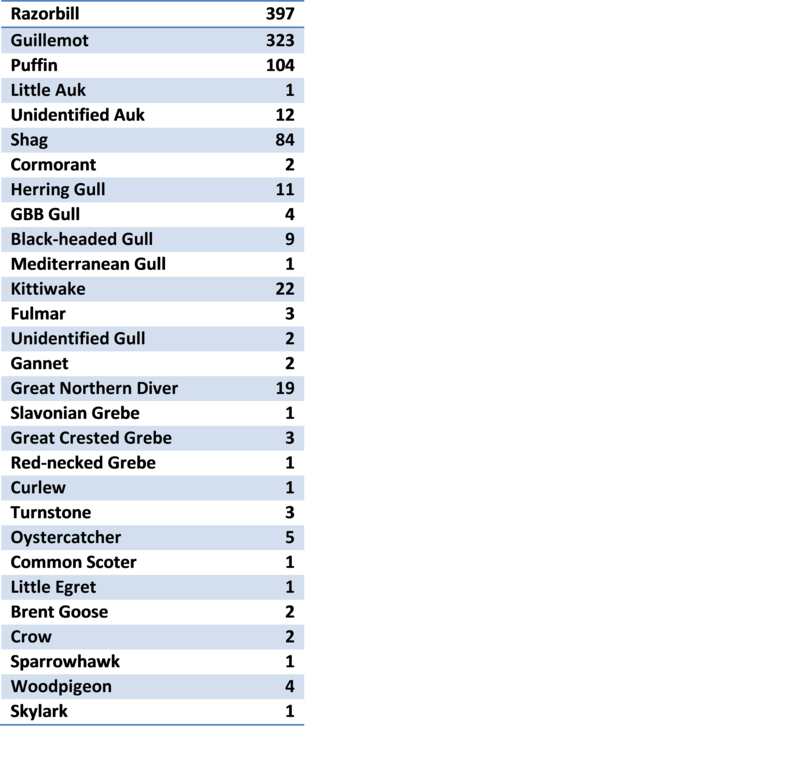 Here is a breakdown of the birds found in Jersey. 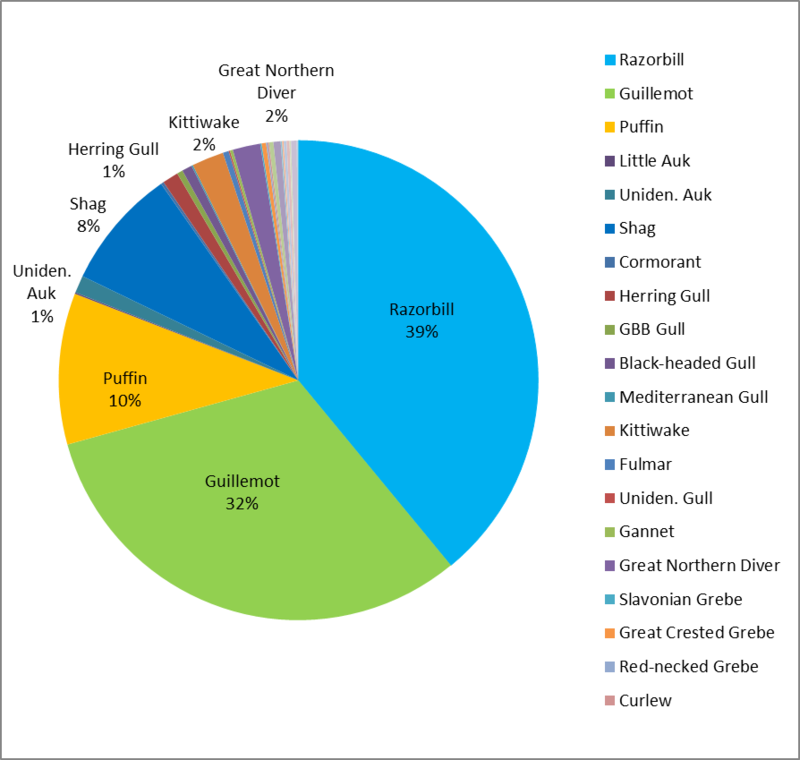 The combined total of all reported birds from the coasts of UK, France and Spain is a horrifying 32,156, which is a conservative minimum as many birds may have sunk in the oceans or been grounded on inaccessible shores. On top of that, news from France suggests this might still go up by 5,000 at least. The unusual series of strong storms we saw this winter are to blame. Most seabirds spend these months at sea, moulting their flight feathers and feeding. The storms would have weakened them and make diving for fish difficult in high waves and 100mph winds. The effects of the storms did not cease after the bad weather, as the waters remained murky for many weeks, making fishing still difficult. Unfortunately, these storms have been predicted to increase in strength and frequency as part of new meteorological model accounting for climate change. 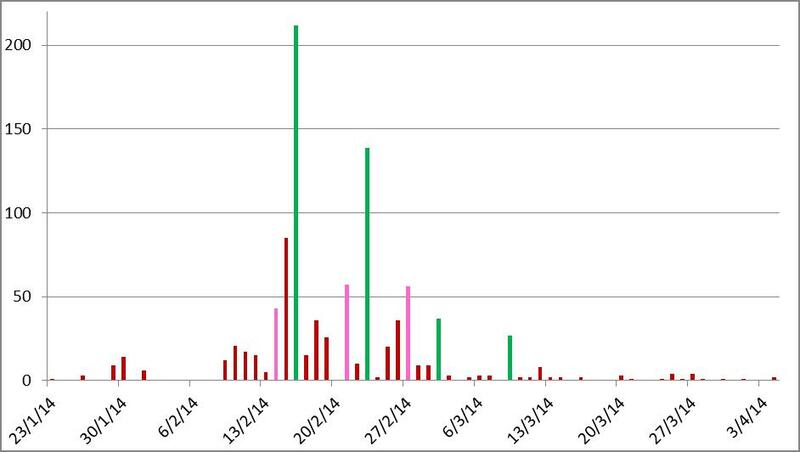 Thankfully, the number of reported birds has started to decrease as you can see on the graph. The columns in green mark survey dates, the ones in pink mark reports in bulk. 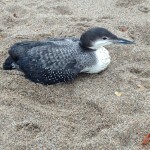 What effect will this have on seabird populations? The effect this wreck has had on the populations of seabirds will only be seen when the survivors return to their breeding colonies in the UK, Scandinavia and other parts. Only then local researchers will be able to quantify the effect the storms have had on the breeding populations. 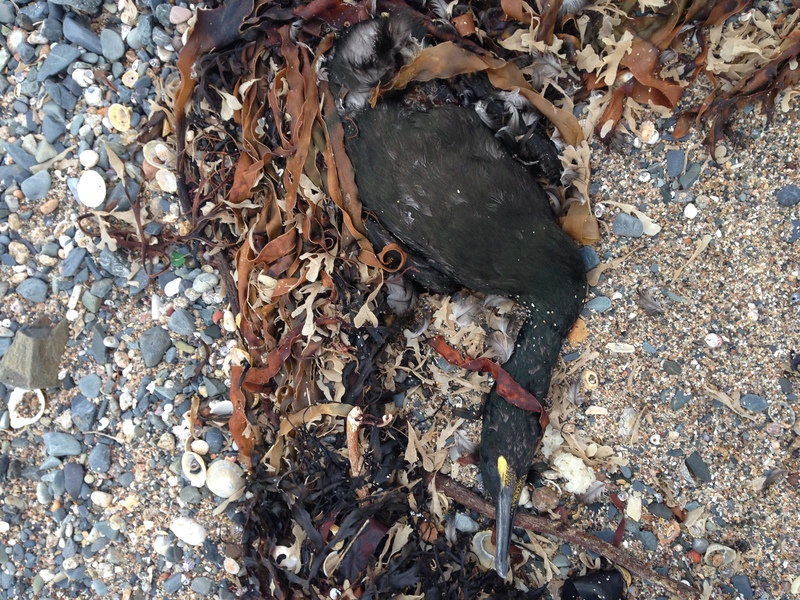 Actions have been taken across the Channel Islands since news of the seabird wreck started to spread. In February a conference call was held between organizations and governments of the different Islands to discuss the findings and possible impacts on our breeding colonies. A few weeks later a workshop was organized by the Alderney Wildlife Trust that got together bird experts and vets from Guernsey, Jersey and France, to discuss survey methods and carcass examination techniques. 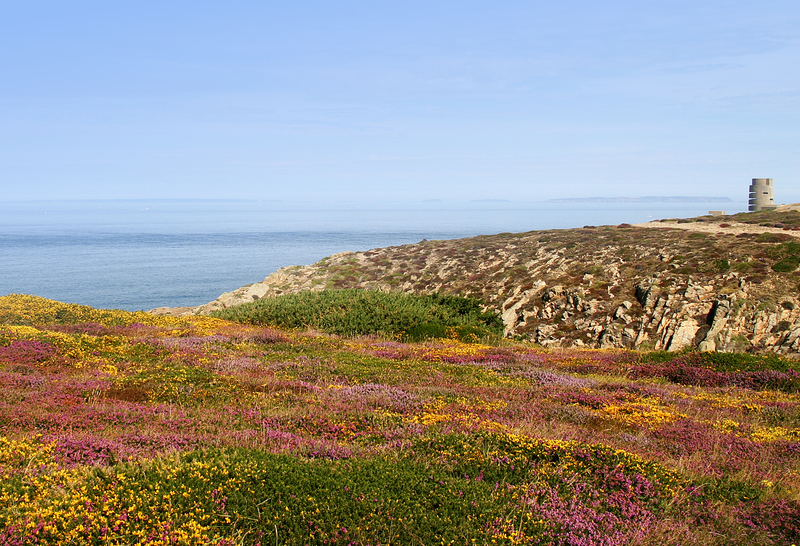 The Alderney Wildlife Trust has also set up a webpage (here) to report birds found on the beaches and thanks to them the links between the islands and France have become stronger. 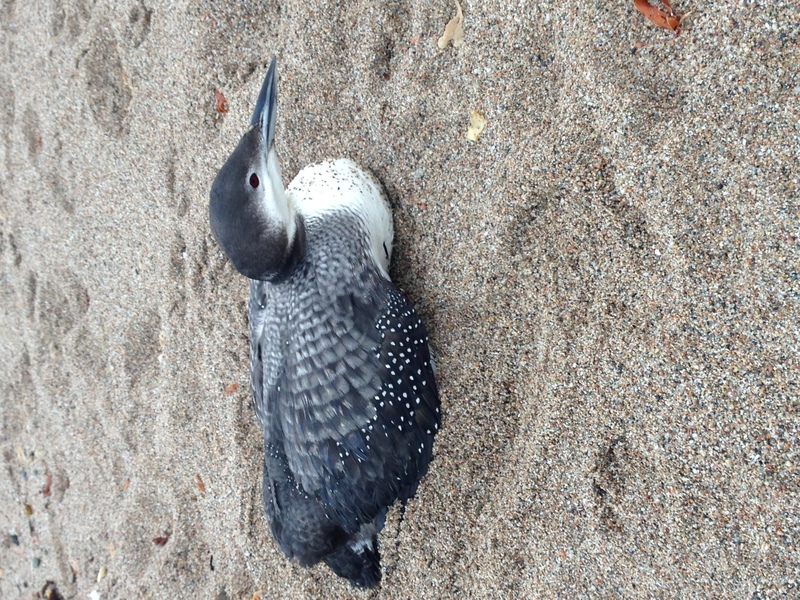 We have established common protocols to monitor beaches that will allow us to detect future events such as a seabird wreck or a pollution incident, as well as standardizing carcass examination and data collection. Beyond dealing with the wreck itself, a call has been made to local governments to support an islands-wide survey of our local breeding colonies as well as to step up the current guidelines of protection of our colonies against human-caused disturbance, which is one of the main factors affecting their breeding success. PS. This report had 1022 words, one for each dead bird found in Jersey.